Over the past year or so, we keep seeing trends and stories about companies who are looking to bring SEO or SEM in-house. For the most part we can make an assumption that these are companies who get Search and how have dedicated budget for SEO and SEM. So with no shortage of "search engine optimizers" out there, I was curious as to what companies would pay for an experienced SEO consultant/strategist? I did a little research and this is what I found. This individual is ultimately responsible for setting direction and strategies for large companies with earnings from $25MM-$1Bil+. Since this position can create or lose incredible amounts of wealth for a firm, the salaries will often reflect executive-level compensation. This person is responsible for managing a team of SEO personnel in-house and reports to the senior marketing or SEO VP/Director. Interesting figures, that are on the high side for sure. 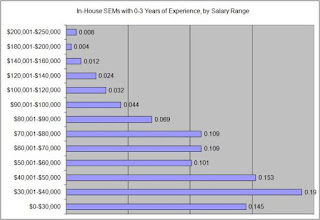 Earlier this year SEMPO released an interesting study on in-house search marketing salaries. So how much would you pay for an experienced SEO? Looks like the supply is limited but the demand is high.